Isn’t it time you treated yourself to a bite out of the Big Apple? 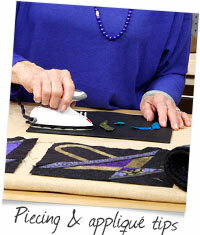 The Quilt Alliance has a fantastic weekend of fun planned for quilt lovers like you in New York City, September 27-29. Join us! The Alliance’s annual fundraiser, Quilters Take Manhattan, has expanded considerably this year based on great feedback from our 2012 guests. Along with our featured speaker, Hollis Chatelain (at left), and Go Tell It at the Quilt Show! interviews with Paula Nadelstern and members of her artist’s group Semper Tedium, this year we’ve added two days of add-on events (Friday and Sunday), available to all those who register for the FIT event on Saturday, Sept. 28. Add-on’s include small-group workshops at The City Quilter shop, outings to the Garment District and “Wicked” on Broadway, and rub-elbow receptions with quilt world stars, established and emerging. Visit the QTM event webpage for complete information about all the events. Also new this year–vendors! Many of our Gold sponsors will have product tables at the FIT event with an array of goodies for sale including fabric, thread, documentation supplies, and quilt kits. Click on the link below to register for Quilters Take Manhattan in New York. Can’t make it to NYC in September? Click on the link below to purchase a Home Ticket! Only $25 for Alliance Members.